Globalization: the combination of Internationalization and Localization. Internationalization (i18n*): making your application is able to support a range of languages and locals. It’s always recommended to read the language accepted by browser from the request coming to the server due to diversity in browsers. So, write a code in controller to get the culture. Create an html element hidden field to hold at client side to persist this culture. Later, we use this hidden field in angular and render the respective language file. In most of the requirements, we require to change the label texts based on the user’s culture. So we create a resource file for each culture and access it. Here, I am going to create a json file for each culture as json is a light weight and easy to load from angularjs. Create a MVC project and add the angular packages. Please refer my previous article for basic setup of angularjs in MVC5. 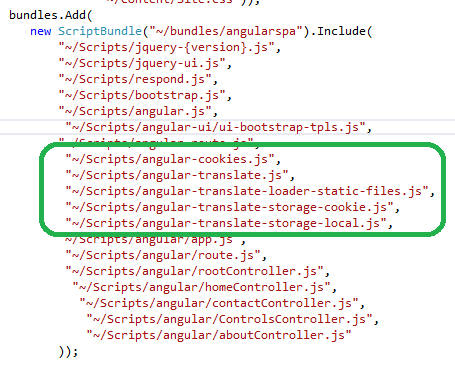 As well, copy the angular-translate-loader-static-files.js, angular-translate-storage-cookie.js and angular-translate-storage-local.js files to your scripts folder. Add ngcookies and translate directives to angular module as below. The format of the json file as follows. From above, using the $translateProvider for loading the json files, accessing the language (culture) from hidden field and passing the language to the translateProvider function to render that culture specific file. Note: As we are accessing the json file types, remember to add the MIME type in web.config. Otherwise you will get 404 error while retrieving the json file. Now, add the translate key word and keys that were defined in json file to html elements or controls wherever you require to display culture specific text. That’s it. We are done, the output looks like as below. Please download the working sample from below location.